I know a lot of people that love to play games on laptops instead of PC. I’m not one of them, but I understand the modularity you get with gaming laptops and that’s why I like them. Today, I will show you the best gaming laptop under $1500, and you will definitely like it! There are a lot of options on the market right now, and you need to choose wisely. $1500 is more than enough for good gaming laptop in 2019. I am sure that after reading whole text you will have a clear vision for your next purchase. 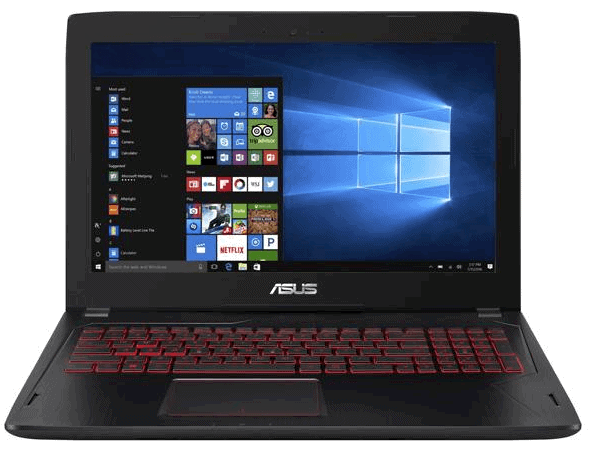 What Is The Best Gaming Laptop Under $1500? Quick Disclaimer: All laptops on this list are priced for less than $1500. Also, they are not in any particular order, so if you don’t have time to read, you can scroll down to see the best laptop under $1500 for you right now. Helios 300 is an amazing gaming laptop from Acer and I love all about it. It has a great screen with a nice keyboard. Components are top notch, featuring i7-7700HQ with GTX 1060. You can't ask for anything else. It has a great amount of space also. All in all, I am impressed by this laptop. Oh man, I really love this design. You can't say that it is ugly or something like that. I love that famous gaming color combination of red and black. It has a lot of little details that combined look sick. Build quality is also impressive, and everything is rock solid. Acer used only high-quality materials for it. The model that I put here is on the edge of our budget. However, you can modify it and add something more if you have more money or just go with the cheaper option if you don't. Whatever you choose you won't make a mistake because this laptop is definitely worth the price that is retailing for. This is probably the greatest looking laptop on this list. It has that famous ‘gaming’ look with all little details. The whole Helios 300 is black with the nice aluminum look. There is big Predator logo on the back with nice red lines. It isn’t the lightest laptop on the planet, weighing around 6 lbs or 2.7 kg, but at the end of the day, you are buying a gaming laptop, not a notebook. The screen is the best on this list. It isn’t 2K or 4K, but the image is sharp and clean. You will absolutely love it. But, if you are a designer or something like that, this maybe isn’t the best option for you. But for gamers, it is an amazing choice. There plenty of ports: 3 USB ports, 1 HDMI port, SD card reader, LAN port and headphone jack. Speakers are pretty good and loud but don’t expect something special. They are okay for movies and some games. Let’s talk about the keyboard. It is full size, with pretty aggressive red backlit. It has a little bit weird buttons, but I really like them. The mouse pad is normal. Okay for surfing online, but I hope you don’t play games on it. Imagine playing CS: GO or something else on the mouse pad. There is a 720p camera on the top, which is pretty decent for Skype calls or something like that. You can open Helios 300 pretty easy, and switch RAM or SSD. That is a big plus if you ask me. There are a couple of fans, and you won’t have problems with overheating. And last but not least, battery. It is pretty standard, nothing special. You can get around 2 hours of gaming, and around 5 hours of watching movies or just scrolling on Facebook. I will show you some specs right now. Helios 300 is coming with Intel i7-7700HQ, running at 2.8 GHz. It is really amazing. You will be able to do all kind of things with this little monster. But the best thing about this laptop is GPU. It is powered with GTX 1060 with 6GB of VRAM. You will be able to pull almost any game on ultra without any lag. On top of that, you are getting 16GB of RAM. It takes multitasking on whole different level. You can play, talk with friends, stream all of that on Twitch and upload a video on Youtube. I don’t know if you do all of this, but you can do it now! As I said above, the screen is great. You won’t have any problems with it. It isn’t 1440p, but don’t worry about that. This model is coming with 1 TB hard drive and 256GB SSD, which is enough for someone, but if you are like me and you play a lot of games, you will need more. My advice is to save more money and buy another hard drive with 1 or 2 TB. But if you don’t have a lot of games, you will have a pretty fast laptop. Man, this machine has 1060. It can handle all the games out there on ultra. So don’t worry about playing Overwatch or Battlefield 1, because you will be able to pull more than enough FPS on high settings. And it will stay like that for a couple of years. It has similar specs as the previous one, Helios 300. I think that is more than enough because i7 and GTX 1060 will run any game on max settings. The screen is also nice and there aren't any missing parts about this laptop. The only downside is small SSD, but you can easily replace it whenever you won't without problems. This is one of the best looking laptops on this list and I love so much this silver color theme. It just looks different and that's why I like the most about it. It has aggressive gaming look, but that's nice. There are a couple of orange details and they are also nice. After all, we see that Asus know how to make good looking products. It has a really good price and if your budget is $1500, you will be able to save a couple of dollars here. It retails around $1300 which is more than good and I think it is definitely worth the price. If these specs are low for you, and you want something better, you can go with the more expensive model, but I don't think you really need it. 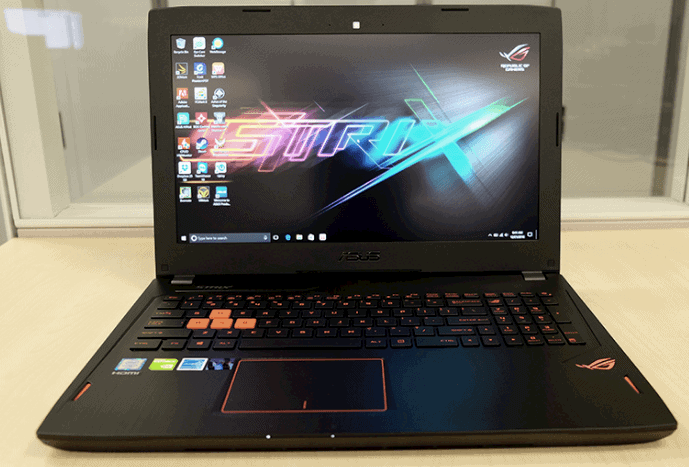 This is another great looking laptop, this time from Asus. This isn’t completely new laptop, it’s just updated version with a lot of new features that you will like. It has a really nice silver aluminum look with big Predator logo on the back. I really love this kind of design because you can immediately tell that this is a gaming laptop. It is lighter than the previous laptop on this list, weighing 4.9 lbs or 2.2 kg. It is really portable and you won’t have any problems with transporting. It comes with 15.6 Full HD (1920x1080) screen, with G-Sync. That is one of the updates that Asus made this year. If you don’t know what G-Sync is, it is a technology that smoothens out frame rates. I really love Asus for putting this. The picture is really nice, and gamers will love it. It also has nice color accuracy and viewing angles. The only thing that annoys me about the monitor is big bezels. GL502 comes with a couple of ports on both sides: headphone jack, USB Type-C port, 3 USB 3.0 ports, LAN jack, 1 HDMI port, 1 mini display port, and SD card reader. I really love speakers on this laptop. They are really good and they can get loud. For gaming and watching movies, they are awesome. The mouse pad is whole in one piece, with nice big buttons. The keyboard is full size, with nice backlit. I love the fact that WASD keys are in orange. As I said above, the whole laptop is in black-orange color theme. The camera is 720p, nothing special but still okay for Skype calls or something like that. The battery on GL502VM is okay. I won’t say that it is bad, but nothing more than okay. It will give you maybe 1.5 hours of gaming and 3-4 hours of browsing the web. But, the charger is lite, and it isn’t problem to bring it with a laptop. GL502VM is coming with new Intel Core i7-7700HQ processor. It is running at 2.6 GHz speed, which is pretty fast. As Helios 300, it is rocking Nvidia GTX 1060 with 6GB of VRAM. Amazing card! With this combo (CPU-GPU) you will be able to play games on ultra with no problems. It comes with 16GB of RAM. It is more than enough to run high-end games or edit some video for Youtube. If you don’t do multiple things at the same time, you won’t use even 50% of it. The screen is pretty great, but I would like to see a 2K resolution. But you can’t put everything in $1500 gaming laptop. As I mentioned earlier, it has G-Sync. It is pretty nice to see that as a standard feature. Some things need to be better than the others. With 1 TB hard drive and 128GB of SSD, you won’t have any problems with storage space. But, you can open laptop pretty easily and put new SSD (if 128 GB is small for you) in it without any hard work. It is really easy to upgrade GL502VM. Perfect combination, if you ask me, is 1TB of hard drive + 512GB SSD. I need to add that this PC is perfect for everyone that likes VR. It is a really powerful machine and you will be able to play VR games without problems. It is the same story as with Helios 300. GTX 1060 and Intel i7 will give you the maximum in gaming at 1080p. You will be able to run all games on ultra without any lag. And when I say without any lag, I think 70+ FPS. And it will be like that for a couple of years. You won’t need to update your laptop if that is a problem in quite some time. This is another laptop with i7 and GTX 1060. However, it has 32GB of RAM which is more than enough for any kind of gaming. Screen and keyboard are also nice, and should I mention that it has RGB? Man, it looks great. Maybe it isn't the most useful feature, but it is always nice to see RGB lighting. All in all, I like it. I really like the brushed aluminum look on this laptop, especially with RGB keyboard. 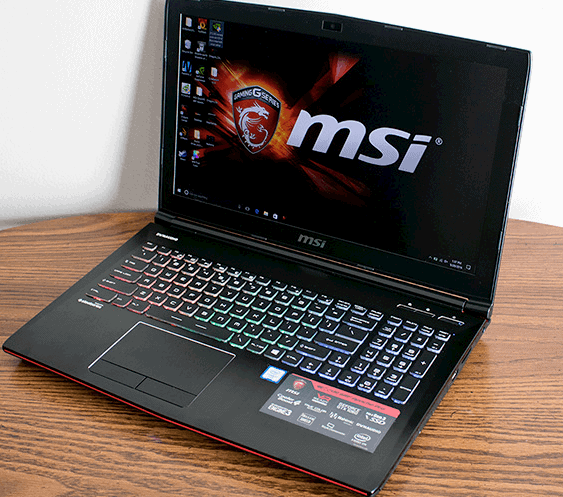 The laptop is all black with red accents, but to be honest, it looks just like any other laptop from MSI. This isn't bad or something like that, but I would love to see something different. However, I still like it, and brushed aluminum is a way to go! Well, if you are looking at this text, I assume that you have $1500 to spend on the good gaming machine. This is on the edge, but there are a lot of different models of the same laptop, so you can configure it based on your budget. I recommend to stick with this one, and you will be satisfied for many more years of gaming. This is another powerful machine on this list. It is really hard to choose the best gaming laptop under $1500 with this much models. But all lovers of MSI will absolutely adore GE62VR. It is the whole black with nice plastic and aluminum build. They really know to make sturdy laptops. I also love back of this laptop because of that nice MSI logo and aluminum look. It doesn’t look so light, but it is. It’s weighing around 5.3 lbs or 2.4 kg. Because of that, GE62VR is really portable and you won’t have problems with transporting. I really like MSI’s screens. They are really great looking with nice color accuracy and great viewing angles. It is 15.6 inches Full HD, but if you are a designer or something similar, you can upgrade to 2K resolution. But, if you are a regular gamer, my advice is to stick with 1080p and I will tell you why. You should stick to 1080p because GTX 1060 will be able to pull games on ultra for a couple of years from now. That’s the main reason. There are a lot of ports on both sides. It comes with: 2 audio jacks, LAN and HDMI port, 3 USB ports, SD card reader, USB Type-C and display port. 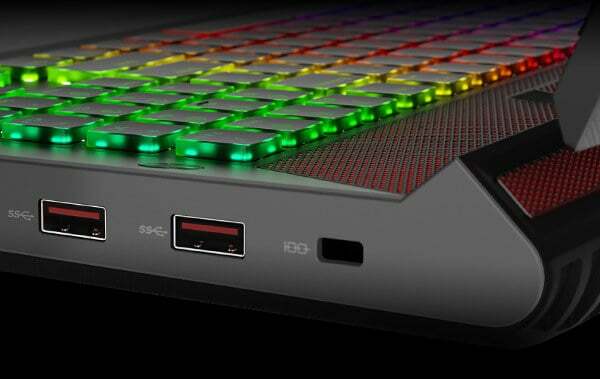 I really love to see this amount of ports on gaming laptops. Speakers on GE62VR are pretty good and it has a small subwoofer. They are nice for watching movies or play some games, but I don’t know who wants to play FPS games without headphones. Mousepad could be better, but for scrolling on the internet, it is okay. It isn’t bad or anything, but they could put some more work on it. However, the keyboard is fantastic. MSI really knows to build a quality keyboard with nice backlit. It isn’t fully customizable, but you can use some really great-looking combinations. On all of that, it is a full-size keyboard. The camera is on the top, 720p. As with other laptops, it is pretty standard for gaming laptops. The battery is good for gaming laptops, but don’t expect anything special. You can play games for 1.5-2.5 hours or watch movies for around 5 hours. I would like to see better batteries on gaming laptops! Pretty standard specs for this price tag, but still, they are amazing! New GE62VR is coming with Intel Core i7-7700HQ running at 3.8GHz. I really love this CPU especially when we put it with GTX 1060. Nvidia GTX 1060 with 6GB of RAM is king of 1080p gaming. I love the fact that GTX 1060 in this laptop is almost similar to PC version with little lower speed. If you are thinking about RAM, it comes with 32GB which is more than enough for multitasking. I already mentioned that MSI makes great monitors and that is the case with this laptop also. The screen is really gorgeous, with the sharp and clean image. If you don’t like Full HD and you want something better, you can upgrade to 2K display. But, I said my opinion about that in the previous section. GE62VR is coming with both SSD and hard drive. I love that! It comes with 1 TB hard drive and 256GB SSD. For me, that is the perfect combo. You can put Windows and some games that you play all the time on SSD, and use the hard drive for everything else. This laptop is also ready for any VR adventure you like. Same results as previous laptops. With Intel Core i7 and Nvidia GTX 1060 that is similar to PC version, you will be able to play all modern games on ultra. This is the fact! If you want better performances, you can pay a little bit more and upgrade to GTX 1070, but that is just an option. My honest advice is to stick with GTX 1060 and Full HD resolution for $1500. This can easily be the best gaming laptop under $1500. I can't say anything about these features because almost every laptop on this list has the similar specs. It is the best you can get in this range, and that's the fact. The thing that is important now is other unique features. This laptop is VR ready and I think VR will be really huge in the future so you can prepare for it right now! As I said earlier in the previous review, MSI laptops look similar and that's what I don't like about them. However, the black and red design is pretty nice and it has aggressive gaming look. Brushed aluminum is also georgeus and it is everywhere. The last thing I need to mention is a logo on the back. It looks amazing on the back panel. Price is also pretty similar to others on this list, but it is often on sale. If you can't catch it on sale, you can buy for full price because it is worth it and you won't regret it. 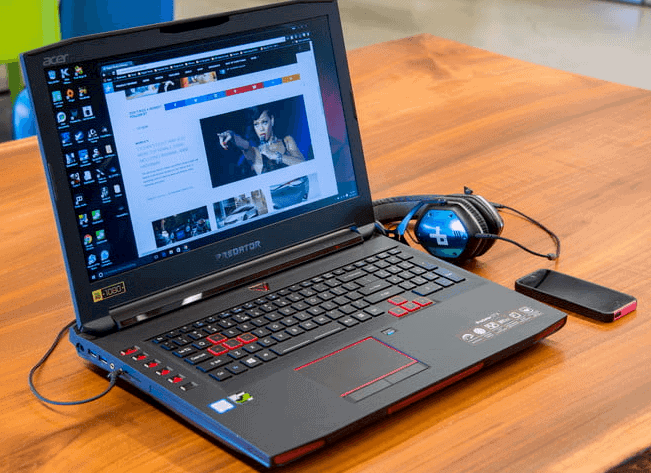 If you love to play games and that is your main entertainment on a laptop, this is a great option because you will be able to play them on the highest settings for years. 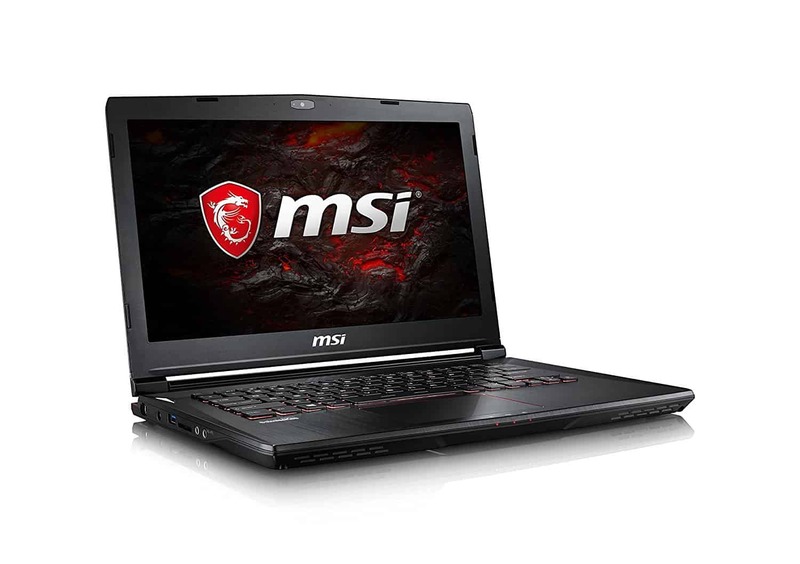 This is another gaming laptop from MSI, but with a lot of differences. The main thing about this laptop is portability. It is really a good-looking laptop, and it doesn’t look like a gaming laptop. It is made from plastic with a nice brushed aluminum look at the back. You can use GS43VR as office laptop, with the ability to run games on ultra without problems. As I said, the main thing about GS43VR is portability. It is really light, weighing around 4.16 pounds / 1.9 kg. 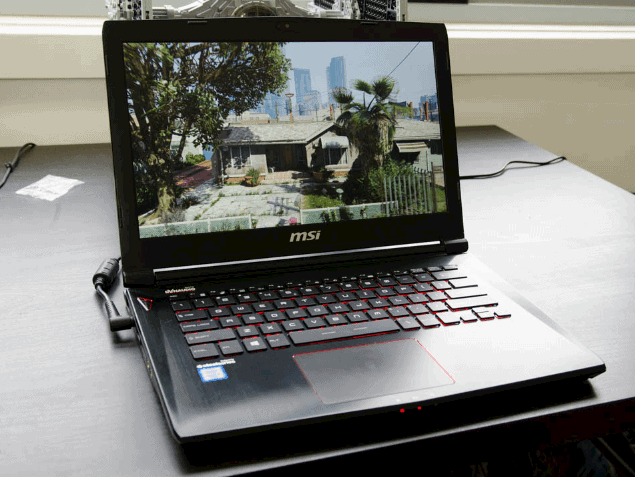 You won’t even feel it in a backpack, and that is a big plus for this gaming laptop. But, screen size is a little bit smaller, 14.3 inches. It is Full HD IPS screen. It is really nice, and I’m sure that you will like it. It has nice viewing angles, with the sharp and colorful picture. I love small, portable laptops like this one, but not everyone wants a small screen. If you want something bigger, maybe the best option for you is to skip GS43VR. It is small and thin, but there are a lot of ports: 2 USB ports, 2 audio jacks, SD card reader, LAN port, HDMI, USB Type-C and mini display port. It is better to have more than to have less. Speakers are well made, great for movies and some games. But, I mentioned earlier in this text that I don’t understand gamers that play FPS games on speakers. I don’t know is it just me, but I can’t play anything without a good pair of headphones. Because of the size, the keyboard isn’t full size like on other laptops. I love the look of it because mouse pad is in the middle now, but I also love full-size keyboards. However, it is a great keyboard with nice travel time and nice red backlit. The mouse pad is looking sick with two big buttons on it. It works perfectly with two fingers on it. The camera is pretty standard, and I don’t know how much you use it, but it will be okay for Skype. It is VR ready, and I like that because, in near future, VR will become something much bigger than we think. We should prepare for that. The last thing about GS43VR is the battery. It is okay, but you will need to carry charger wherever you go. It is a must because you can’t play more than 1.5 hours on this little monster. As I said earlier, this laptop has similar specs to others on the list. It has Intel Core i7-7700HQ, which is perfect CPU for this price tag. You can’t get better for $1500. Of course, you need good GPU, and we already discussed GTX 1060 with 6GB of VRAM. Amazing for 1080p, and that means that you won’t have problems with running games at maximum settings. You can’t go wrong with this combo. Also, don’t get anything lower than i7 and 1060 at this price. It’s the standard in this class. You are getting 16GB of RAM, which will be great for hard multitasking. I think that 8GB is the minimum in 201, but it is better to have more. Storage space is also great, with 1TB hard drive and 128GB SSD. I would like to see bigger SSD, but it will be enough. I said multiple times that I love the combination of both SSD and hard drive. It is perfect! My favorite thing about SSD is speed. With Windows on it, we are able to power up laptop or PC in seconds. It is fascinating. This is the same story as with other laptops. You will be able to run everything on ultra without any lag. As I said million times, Nvidia GTX 1060 is more than enough for Full HD gaming in 2019. You won’t have any problems with gaming. If you like to stream on Twitch, you will be able because you have 16GB of RAM. This is another candidate for the best gaming laptop under $1500 on this list. I love this laptop and the price is great, but it has one big downside. The screen is TN and that is just old. It isn't very good so if you are an editor or something you should skip this laptop right now. It is okay for gaming, but nothing more than okay. However, components are pretty much the same, and that means that you can play all games on ultra. I mentioned multiple times that Asus knows how to make good design and that's the case with this one, too. It has that 'gaming' look, but it doesn't look so aggressive. I really like the balance it has in that way. It is all black with brushed aluminum and red accents everywhere. Build quality is also very good, and everything is top notch. No flexing or breaking. This is the cheapest option on this list, and that's why I love it. If you don't have $1500 right now, maybe you should consider this laptop. It doesn't have the greatest screen, but everything else is pretty much the same. It will run all the games on the highest setting for years, and that's what I love about i7 and 1060 combo. All in all, I recommend buying this laptop. This is the last laptop on this list. And I added this because it costs a lot less than others on the list. But you can’t pay less and expect the same results. This laptop is smaller brother of GL502VM. There are two big downsides, but if you are on a budget and don’t want to spend much, maybe this is what you want. I really love the design of it. It has brushed aluminum look with nice Asus logo on the back. It is all black with some red accents on keyboard and mouse pad. It is also thin and light, which is great for transporting. It weighs 4.9 lbs / 2.2 kg. I really love light gaming laptops, because I can put them in my backpack and don’t even feel them while walking. The screen is 15.6-inch Full HD with TN panel. That is a big downside if you ask me. Colors aren’t great, and viewing angles are bad. If you have money, please go with IPS panel because they are a lot better. However, it comes with good amount of ports: audio jack, 3 USB ports, HDMI port, LAN and mini display port. You won’t get USB Type-C, which I don’t use that much, but if you do, you should consider this. Speakers are okay, but nothing special. They are normal and you can use them for playing some games or watching movies. The keyboard is full size, and it is really well-made. It also has red backlit, and that is nice for gaming laptops. The mouse pad is also great looking with some red lines on both sides. You won’t have any problems with it, and scrolling on it is smooth. The camera is pretty standard, and it will be okay for some camera calls. You can experience some VR gaming, but it isn’t fully ready for VR. And the last thing is the battery. You can get around 1.5 hours of gaming and around 4 hours of watching movies or doing whatever on the internet. I love the fact that this budget gaming laptop has pretty similar components as others on the list. It is powered with Intel Core i7-7700HQ running at 2.8 GHz. However, for around $1200 you are getting Nvidia GTX 1060 but this time, with 3GB of VRAM. This is a second big downside for this laptop. You won’t feel much different now in 2019, but you will in a couple of years. But, I need to mention again that this is a budget gaming laptop with similar specs. It has 16GB of RAM, which is great for multitasking. You really don’t need 32GB of RAM if you don’t do some heavy multitasking. For storage space, it is powered with 128GB SSD and 1TB hard drive. SSD isn’t the best and fastest one, but it is definitely faster than a hard drive. It is a pretty nice combo. But at the end of the day, if you can’t run your favorite game, it isn’t worth the price. You will love this laptop because for the smaller price point, you are getting similar performances in games. You can push almost everything on ultra without any lag, but you will need to lower settings for some titles. 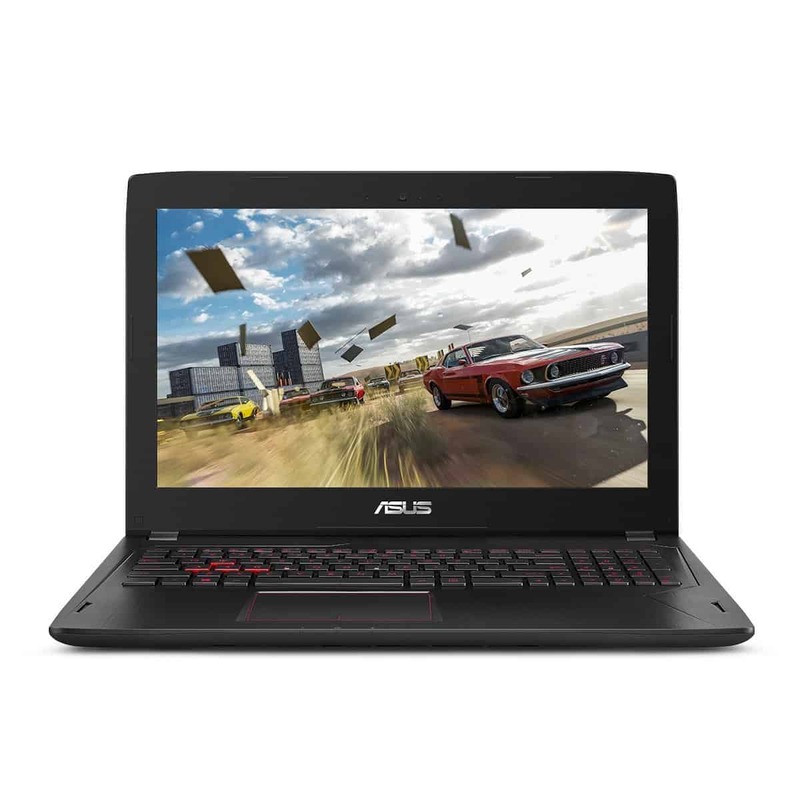 All in all, great budget laptop for everyone that wants to play all new games on ultra. 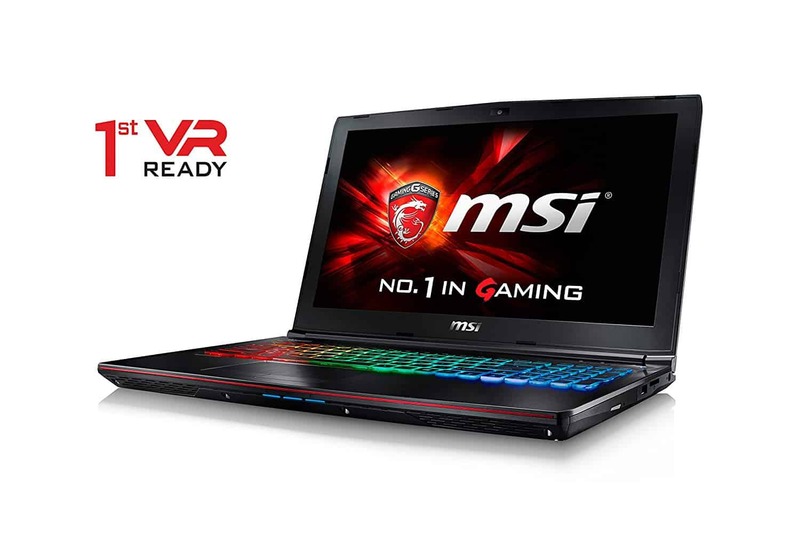 If you ask me, my favorite gaming laptop on this list is MSI GE62VR Apache Pro. They are all pretty similar, but if you want to buy the best gaming laptop under $1500, this is one. Intel i7 7700HQ with GTX 1060 will give you full experience in gaming at 1080p. Also, it has 32GB of RAM, which is more than you need for standard gaming, but it is better to have more than less at the same price tag. That’s my opinion. If you want to buy something on the budget, you should go with Asus FX502VM. It costs less than any on this list, and it has similar gaming performances. But you are also getting TN panel instead of IPS, and 3GB of VRAM. That’s why it costs $300 less than others. If you liked this text, let me know in the comments. Also if you have something to add or you would like to add something, tell us and I will probably update the text.